New to 1978, was the King Cobra option at $1277. The "Boss of the Mustang stable" had a giant snake decal on the hood and pinstripping around the windows, decklid, wheel lips, rocker panels, belt, and over-the-roof area; a large front and rear spoiler, rear quarter flares, spoke wheels, and the 5.0L V8. See our 1978 Cobra Data Explorer for more information. 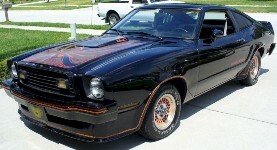 This 1978 Mustang King Cobra is certainly the "Boss of the Mustang stable" as Ford described it. This King was also the Attitude Of The Week for 8-19-07. The King Cobra package came with a snake decal on the hood, unique pinstriping, custom spoiler, a 302 cid 5.0 liter V8, rear quarter flares, a black grille and moldings, color-keyed dual sport mirrors and lacy-spoke aluminum wheels with twin rings and a Cobra symbol on the hubs. This King Cobra has been repainted and is missing some of its pinstriping around the front and side windows. Oxford White 1978 Mustang II King Cobra with a 139hp (at 3600rpm), 302 cubit inch (5.0 liter), 2 barrel, V8 engine. This car has a fresh coat of factory Oxford White and Shelby type blue stripes. The cobra hood and side graphics have been removed. White 1978 Mustang II King Cobra owned by Lem Slauenwhite from Buxton, Maine. It still has the original 5.0L engine and a 4-speed manual transmission. Midnight Blue 1978 Mustang II King Cobra owned by Bobby Aldrich from Placerville, California. It has a 302ci (5.0L) V8 engine and an automatic transmission. This was our featured Attitude Of The Week for the week starting August 15, 2010. Bobby tells us, "I bought my King Cobra about two years ago and just finished restoring it. I found the King Cobra on Craigs List and just couldn't pass it up." If you think this is cool, you need to check out the huge collection of Mustang IIs that Bobby owns. Raven Black 1978 Mustang II King Cobra hatchback owned by Gerry Gray from Latahm, New York. Gerry adds, "I purchased from the original owner in 1989. The exterior was originally red with an orange and gold King Cobra stripe package. The original 302 block was cracked so the car now sports a mild 306 and T-5 transmission. It is equipped with factory T-tops, 4-way adjustable front seat, power steering and brakes, 15-inch wheels, dual 2.5 inch exhaust into a single 3-inch over the the rear, rear mounted battery, subframe connectors, SSM lift bars, and aftermarket Autometer gauges"
Bright Yellow 1978 King Cobra Mustang II hatchback with yellow color matched lace wire wheels, King Cobra side lettering, full pin striping (including the green house or around the windows), hood scoop, color matched mirrors, and a hint of the large Cobra hood graphic. The exterior of this car had not been heavily restored, its pretty much all original. William Sanseverino sent us pictures of his 1978 King Cobra. He says, "This is my 12th Mustang over the years, and my 5th Mustang II. My first II was traded in over 35 years ago. I've had 3 previous IIs in the past 5 years, but none have had what I call 'a hole in the roof', so I sold them searching for just the 'right' II. I found this T-Top 1978 King Cobra online last year (spring 2017). It had over 97,000 miles on it, had surface rust in places and probably needed a fair amount of mechanical work, but this was finally a King Cobra with T-tops AND it was in the unusual white with blue stripe color combination so I had to have it. The interior was all original and just needed to be cleaned up. At the time factoring in what nice Kings were going for without T-tops, I took a chance and bought. After some snafus with the restoration facility doing the body work (who farmed out the rebuilt 302 V8), I finally got it back on May 4, 2018. Other than bodywork, paint & stripes, everything is original." A beautifully restored to factory color Dark Brown 1978 Mustang II King Cobra hatchback with gold Cobra hood graphics, t-top, color matched lace wheels, and a 5.0L 2-barrel V8 engine. This amazing custom 1978 Calypso Coral orange 1978 Mustang II King Cobra II was at the 2010 Mustang Round-up car show in Bellevue, Washington. This car has 1987 Mustang turbine style wheels. Black 1978 Mustang II King Cobra hatchback as seen at the 29th Annual Central Illinois Ford Day Show at Dennision Ford in Bloomington, Illinois. This one has the 302ci V8 engine, 4-speed manual transmission, power steering, power brakes, T-tops, luxury interior, and tinted glass.